FILE - Internally displaced Afghan children stand outside their shelter in the cold at a refugee camp on the outskirts of Herat city. The United Nations warned Monday that growing attacks as well as the misuse of medical and education facilities by all parties to the Afghan conflict have reduced the availability of health care, and limited children’s access to these essential services in the past three years. A new report jointly produced by the U.N. Assistance Mission in Afghanistan (UNAMA) and UNICEF says violence-related activities last year killed 31 health workers and personnel associated with the education sector, wounded another 58 while 115 were abducted. The figures marked a sharp increase over incidents documented in 2014. “The report’s findings are deeply troubling. It is simply unacceptable for teachers, doctors and nurses to be subjected to violence or threats, and for schools and medical facilities to be misused or attacked,” a statement released in Kabul quoted UNAMA chief Nicholas Haysom as saying. Haysom called on all parties to take measures to protect education and health services in Afghanistan. The U.N. released its report as fighting has intensified across Afghanistan and reports say Afghan security forces have occupied schools in Helmand province to use them as bases against the resurgent Taliban. The majority of the 257 incidents documented in 2015 were comprised of threats and intimidation, including death threats, assaults of health and education personnel, forced closures of schools, letters prohibiting school attendance - particularly against girls - extortion and other harmful acts, the report noted. 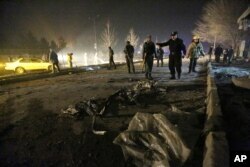 FILE - Afghan security forces inspect the site of a suicide attack near the Russian embassy in Kabul, Afghanistan. Conditions in Afghanistan are getting worse. It also documented incidents of improvised explosive devices detonated near schools and clinics, killing and wounding health care and education personnel. “In 2015 children increasingly struggled to access health and education services in Afghanistan due to insecurity and conflict-related violence, further exacerbated by high levels of chronic poverty throughout the country,” said Akhil Iyer, UNICEF representative in Afghanistan. The U.N. report says conflict-related violence resulted in the partial or complete closure of more than 369 schools in 2015, affecting nearly 140,000 students and 600 teachers across Afghanistan. It also noted attacks, threats and explicit prohibitions imposed to restrict girls’ education in the war-hit country. “Efforts must be redoubled to enable children - particularly girls - free and safe access to medical services and education, said Danielle Bell, UNAMA human rights director. On Sunday, UNAMA said children were almost one-third of the nearly 2,000 civilian casualties caused by the Afghan conflict in the first three months of 2016.